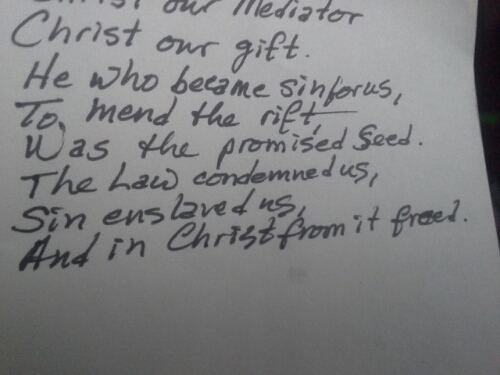 I jotted down a few verses today as I was thinking about Jesus’ incarnation—the eternal God dwelling with sinful man. Forgive my clunkiness. Besides a few scant words in my pocket notebook, I haven’t written much during the past twelve months. Before the poem, here’s a little of what I’m ruminating on. Every year right around the day after Thanksgiving, when most of us are still getting over pie coma, our thoughts turn towards the hustle and bustle of Christmas. And it’s often customary or, as in Christian culture, even obligatory to reflect on the “real meaning of Christmas.” While it is true that this is a cliché, I personally resist letting that get in the way of dwelling on Christ during Advent as well as the rest of the calendar year. In his book Knowing God, J.I. Packer wrote, “The Almighty appeared on earth as a helpless human baby, needing to be fed and changed and taught to talk like any other child. The more you think about it, the more staggering it gets. Nothing in fiction is so fantastic as this truth of the Incarnation.” As I ruminate on Christ again and again, I realize the nature of his birth, nothing short of miraculous, only sets the stage for his accomplishment on the cross. Still, his birth ought not to be skimmed over to get to the good part. The poem below is but a small result of my ruminations. Reaping rubbished good, tasting the bitterness of our sin. We saw, like Zebulun and Naphtali, a great light brighter than noonday. Despondent in guilt and shame, still, we delighted in doing wrong. The light shined in the darkness, convicting and revealing we needed Christ all along. You chose us to be yours before you laid the foundations of the world. Your Son came to seek and save us, and upon him our sins were hurled. Your love in the light you sent to us to who dwelt in darkness on this Earth. O that the God who made the Universe came down to man through a virgin birth! And in Christ from it freed.